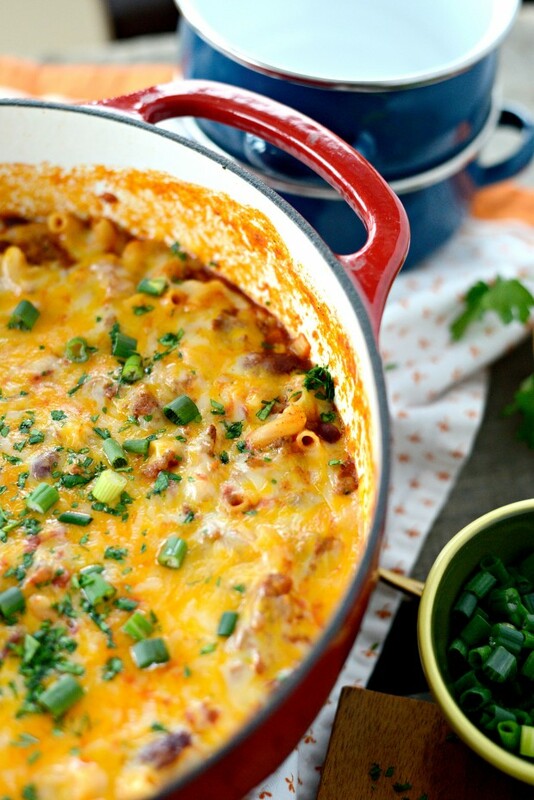 This one pot chili mac & cheese is crazy simple and majorly delicious! 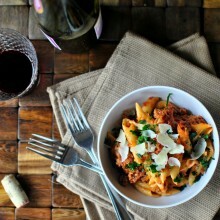 I morphed two classic recipes for one fabulous dinner! I would like to request a do-over for this week. I’d like to go back and not take out the garbage, so I wouldn’t slip on the patch of ice in the driveway and nearly break my ankle. Then on Tuesday when I “thought” I left my phone at the market by my house and their employees dropped what they were doing to kindly help me find it. Searching high and low, in the produce, by the bread… but (tee-hee) it was in my car the entire time. 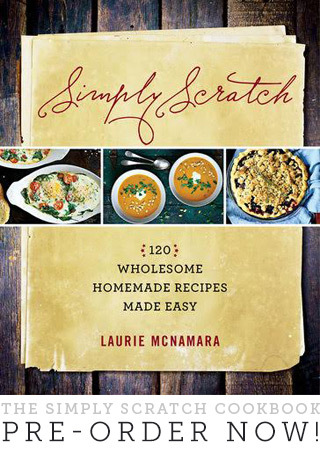 While we’re at it, I would definitely like to redo Sunday, when I didn’t lock my doors of my car because we live in the middle of nowhere (sort of) and in such a safe neighborhood and yet someone went into my car at night and took an Amazon box that had 4 of my cookbooks in it. I’m sure whoever-it-was was hoping something majorly exciting or valuable going on under those cardboard flaps. Like a hoverboard or something. Nope. Cookbooks. I’m totally going to assume it was some neighborhood kid, because my husband had one of those variety bags of chips in his truck (he was going to take them into work to have with his lunches) and the thief stole those too. Chips and cookbooks? Seriously, I get the chips… but who steals COOKBOOKS? They’re probably in some trash can or worse on Ebay. UGH! It’s okay, I’m alright. I’m over it. Sort of. Not really. *I’d like to insert that this (Friday) morning I said sure to Malloree making herself a to-go cup of hot chocolate before we left for school (hey- it’s Friday, why not?). She’s 11, no biggie- but when she went to put on the whipped cream her hand hit the lip of the cup spilling an entire 10-ounce cup of hot cocoa down the front of her. She’s totally fine, no burns or anything, but the cocoa went everywhere- in drawers, down cabinets. Fun times. AND THEN while I was backing out of someones driveway (to turn around and go back to get my daughter’s lunch that she forgot) I slid into a mailbox. No damage done. Phew. All of this before 7 am… I’m not kidding when I say it’s been that kind of week. So yeah, let’s redo allll of that. Can we? 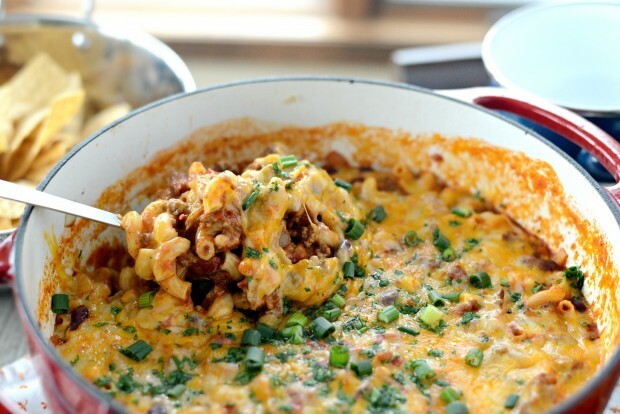 But I’ll tell you what I don’t want to redo… this chili mac and cheese. Holy Yumsville! You guys it’s chili and cheese in the most glorious one-pot masterpiece. It’s magical cheesy fingers wrapped around my heart and consoled me. It almost erased the feeling of violation I have from someone being inside my car. Cheesy-carb-coma-to-forget-my-horrible week here I come! 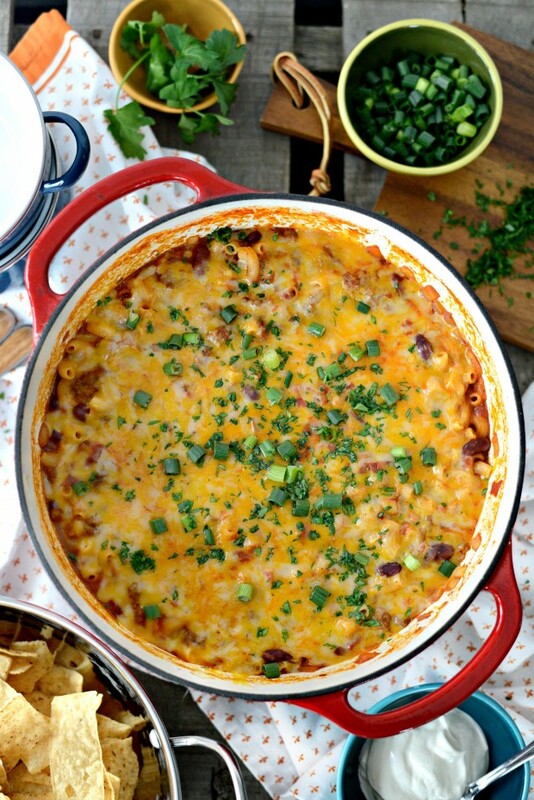 I decided to take my chili recipe and turn it into a chili meets mac and cheese. 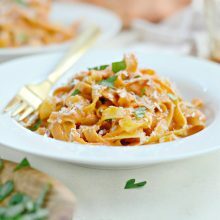 It’s so ridiculously simple and super darn tasty too. 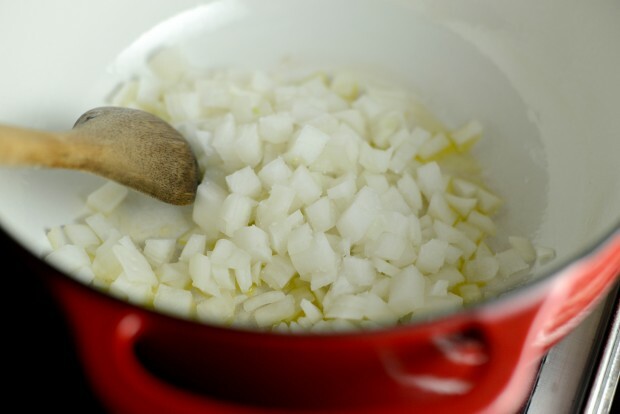 Start by sauteing 1 cup of diced white onions in a little olive oil. 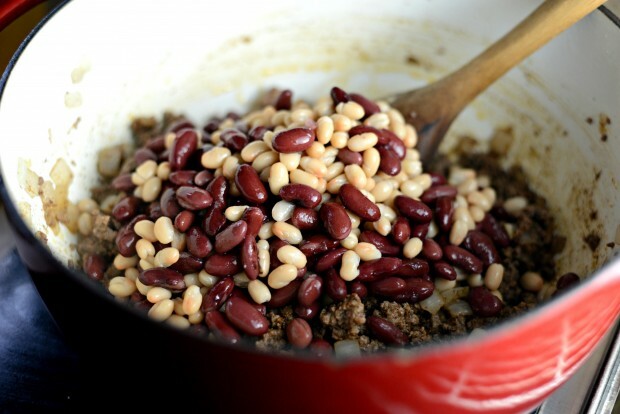 Once they’ve softened up a bit, add in the two minced garlic cloves and cook for a minute or two. 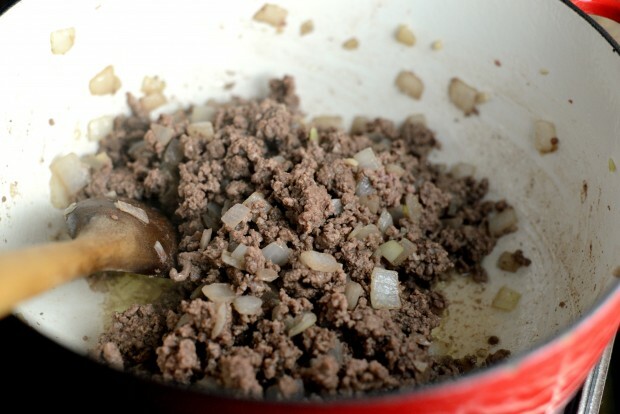 Drop in the 1-1/2 pounds of ground chuck and break it up into crumbles. 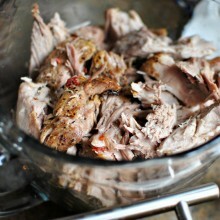 Once fully cooked, drain out the fat and discard. 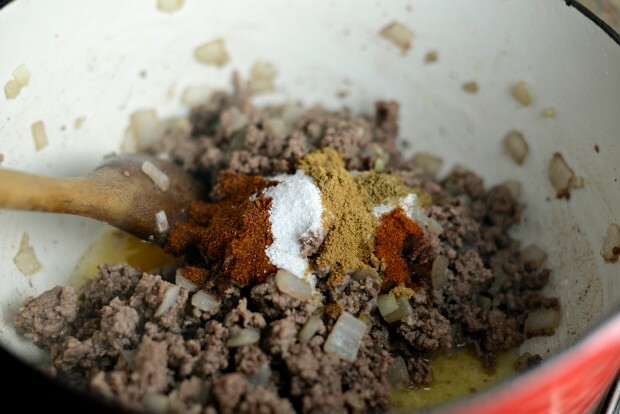 Add in the tablespoon of chili powder, 2 teaspoons of kosher salt, 1 teaspoon of both sugar and cumin, and an 1/8 a teaspoon of both celery salt and cayenne pepper. *please note that I thought I had pinto beans in my pantry, but umm no, what I had was navy beans. Hence the reason they’re so pink and small in the photo. But typically I use pinto. Add in one 28-ounce can of crushed fire roasted tomatoes. One 8-ounce can of tomato sauce (or 1 cup). And 3 cups of low-sodium chicken broth. 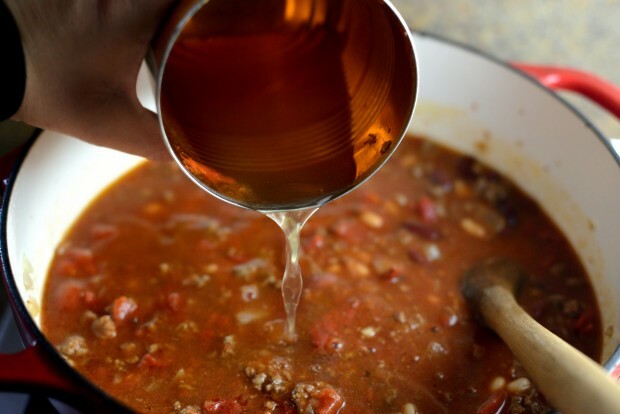 I add the broth to the cans and swirl them around to get any extra tomato goodness out and into the chili. 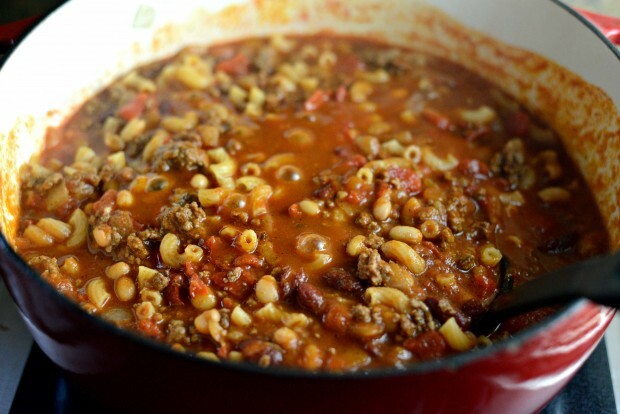 Bring the chili to a boil and add in 1-1/2 cups of elbow macaroni. 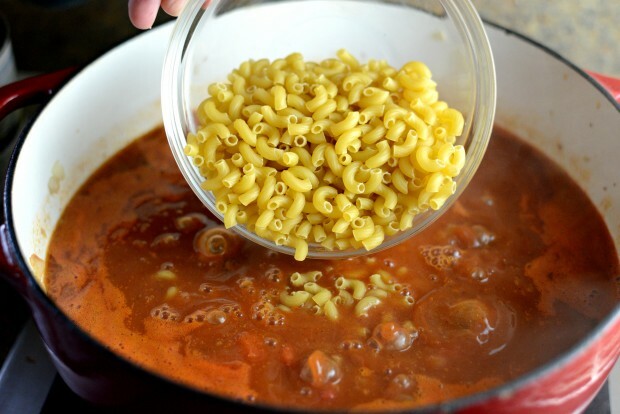 Reduce temperature to low, cover and cook for about 14 minutes or until the noodles are al dente. 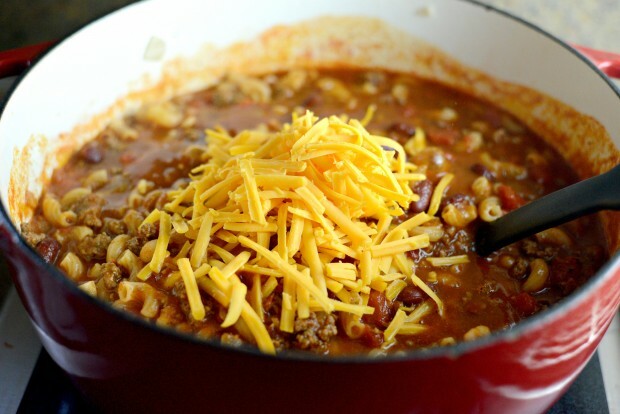 Add in a heaping 1/2 cup of sharp cheddar cheese to the chili-mac. Stir it in and then sprinkle 1-1/2 cups of freshly grated colby jack over top. Cover and wait a couple of minutes until the cheese has melted. 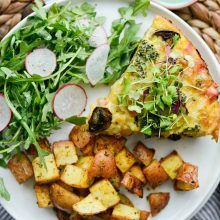 Sprinkle the top with minced fresh parsley and sliced green onions for a burst of freshness and some green. 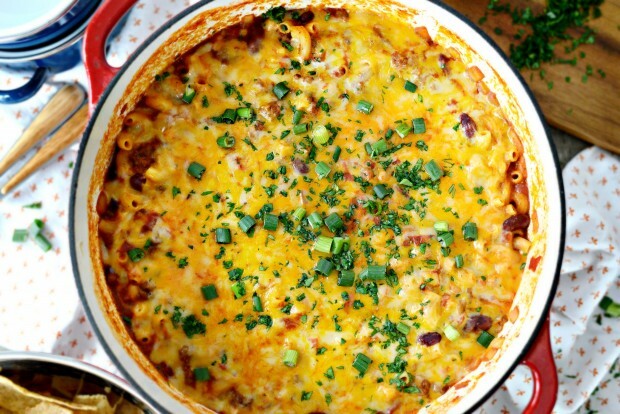 This one-pot chili-mac and cheese dream of a recipe is so easy and takes no time whatsoever! I served mine as is with a little extra green onion on top. Pat put sour cream and a little Frank’s Red Hot on his. It’s a choose your own adventure sort of situation. What it doesn’t need is cheese. It’s got plenty of that. 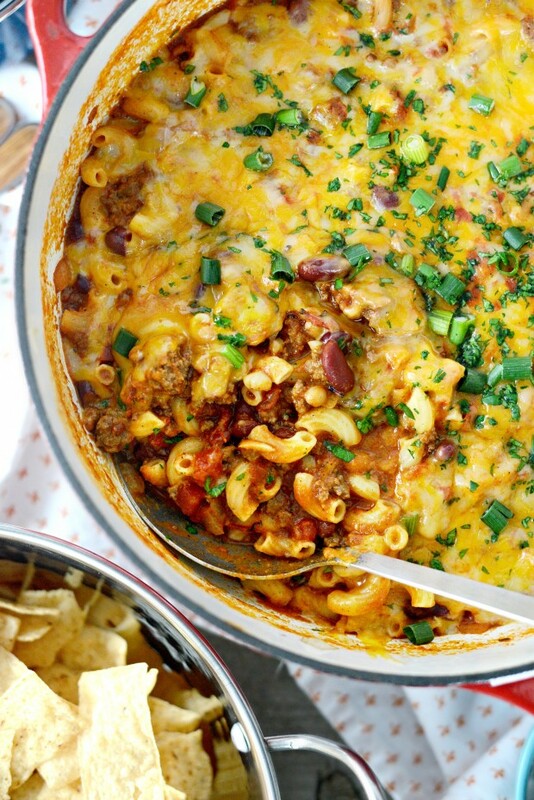 Chili + Mac + Cheese = a super easy, one-pot masterpiece! Heat the olive oil in a large Dutch oven over medium heat. Add in the onion and cook until softened, about 5 minutes. 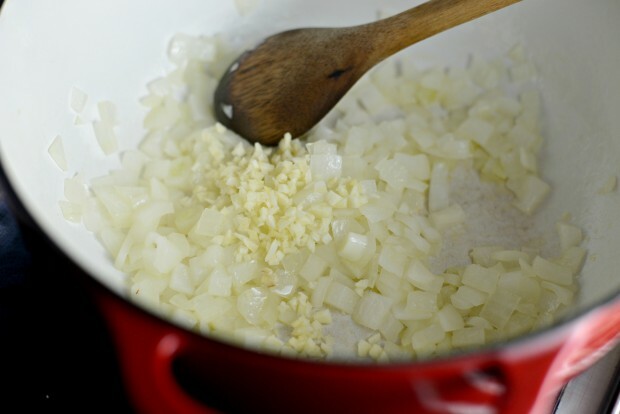 Once soft, add in the garlic and cook 1 to 2 minutes. 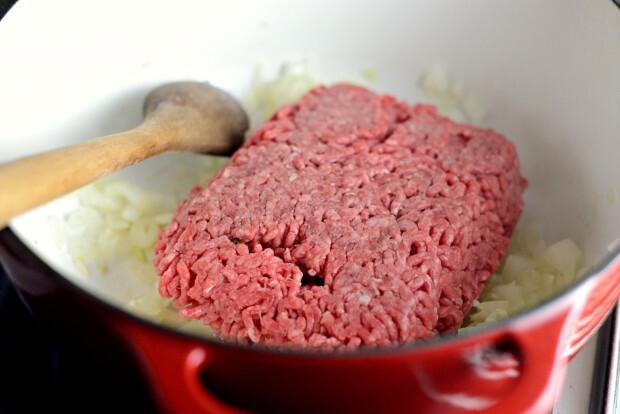 Add in the ground chuck, break into small crumbles and cook thoroughly until no longer pink. Drain all the fat and discard. Season the meat with chili powder, salt, sugar, cumin, celery salt and cayenne. 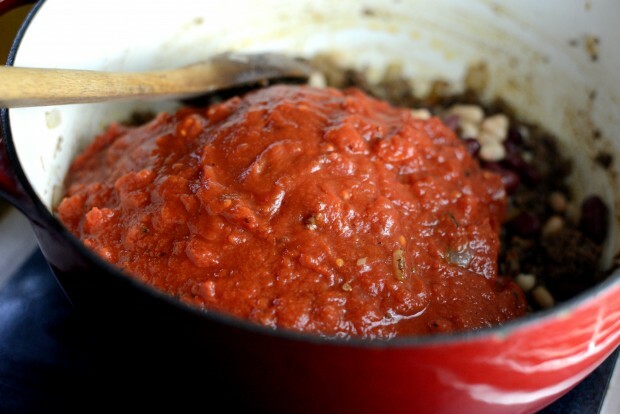 Add in the beans, fire roasted tomatoes and tomato sauce. Measure out the 3 cups of broth and add to the tomato cans, swirling the cans to get any sauce still clinging to the sides before adding to the chili. 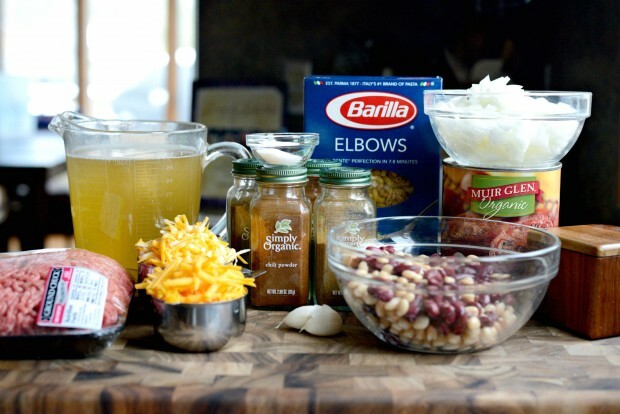 Bring the chili to a boil and add in the elbow macaroni. 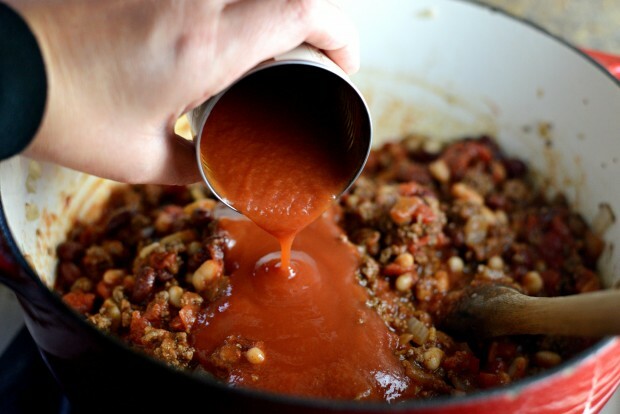 Cover, reduce heat to low and let the chili simmer for 14 minutes or until the pasta is al dente. 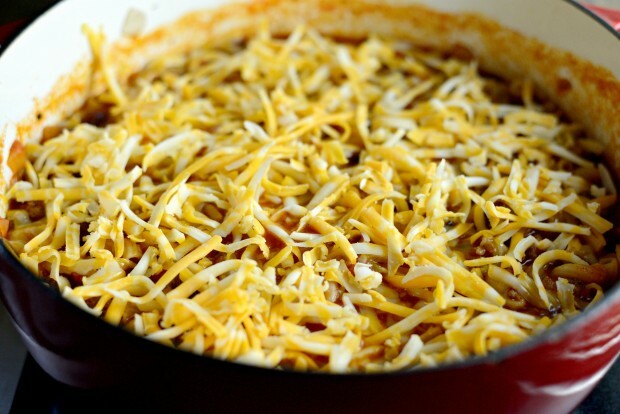 Stir in a heaping 1/2 cup of grated sharp cheddar cheese and sprinkle the colby jack over top of the chili-mac. Cover and let the heat melt the cheese. 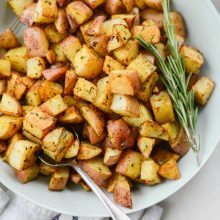 Serve with a sprinkle of chopped fresh parsley and sliced green onions. 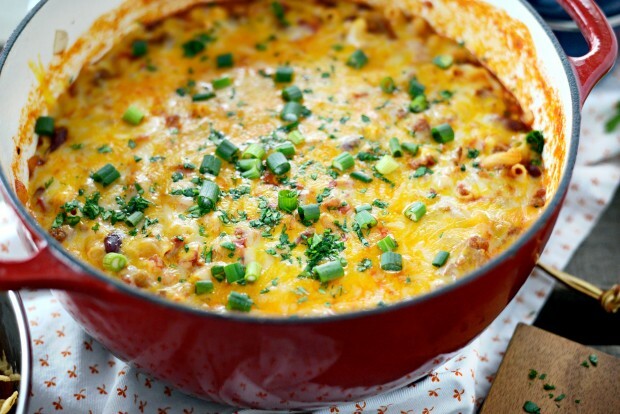 Serve in to bowls and top with sour cream, hot sauce and green onions. 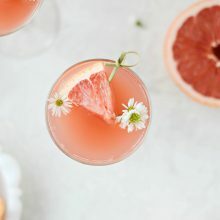 Doubled this recipe and wow!!! 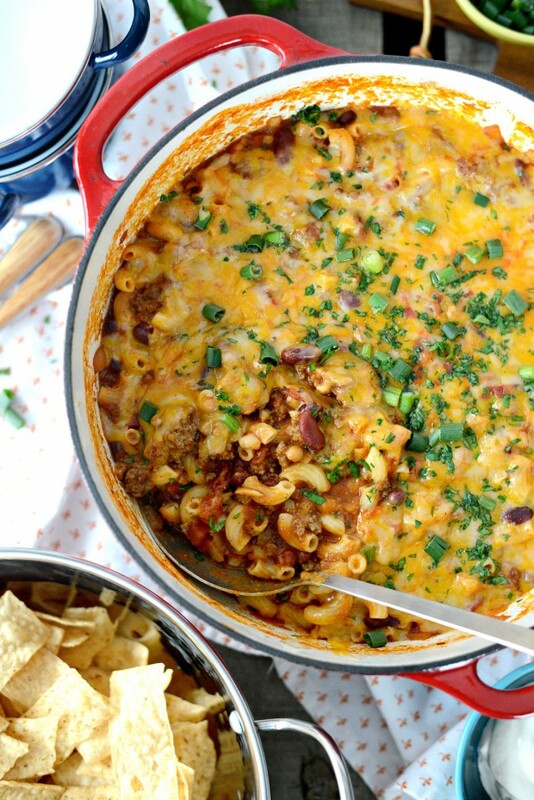 This is some of the best chili mac I’ve ever had. Thanks for another keeper! Thank you for another wonderful recipe. It was a delicious and comforting meal. 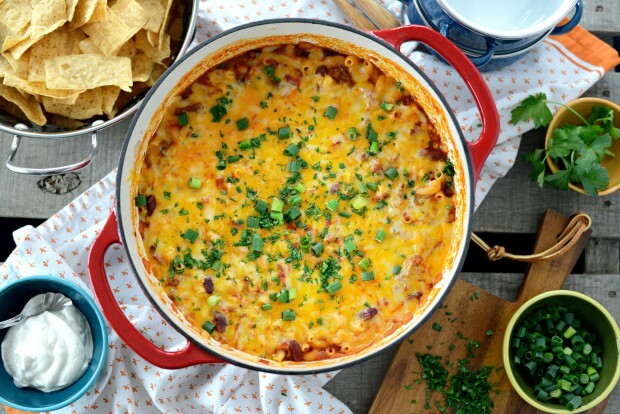 Made this for dinner tonight, Laurie, and boy was it a big hit! Just fantastic flavor, and a great change from regular chili! Thanks for another great recipe! I’m so happy to hear it, Jane!